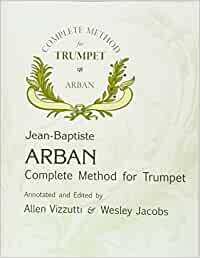 Allen Vizzutti, trumpet virtuoso, celebrated soloist and noted educator, has produced this new edition of the famous Arban Complete Method for Trumpet.All of Arban's original material is now complemented with Mr. Vizzutti 's unique insight into the demands being made today.Spiral bound to sit flat on the music stand. This is the first totally new Arban in a generation. Equally at home in a multitude of musical idioms, Allen Vizzutti has visited 40 countries and every state in the union to perform with a rainbow of artists and ensembles including Chick Corea, 'Doc' Severinsen, the NBC Tonight Show Band, the Airmen Of Note, the Army Blues and Army Symphony Orchestra, Chuck Mangione, Woody Herman, Japan's NHK Orchestra and the New Tokyo Philharmonic, the Budapest Radio Orchestra, the Saint Paul Chamber Orchestra, the Leipzig Wind Symphony and the Kosie Wind Orchestra. Performing as a classical and a jazz artist, often in the same evening, he has appeared as guest soloist with symphony orchestras in Tokyo, Germany, St. Louis, Seattle, Rochester N.Y., Syracuse, Milwaukee, Buffalo, Phoenix, Croatia, Slovenia, Edmonton, Vancouver and Winnipeg to name a few. Music lovers in Germany, Poland, England, Sweden, Brazil, Canada, Japan, Australia and the United States have heard his brilliant sound over the airwaves of national television. Allen's status as an artist has led to solo performances at the Hollywood Bowl, Carnegie Hall, Newport Jazz Festival, Banff Center for the Performing Arts, Montreaux Jazz Festival, the Teton, Vail, Aspen and Brechenridge Music Festivals, the Charles Ives Center and Lincoln Center in New York City. From his home in Seattle Washington, Allen's current career activities embody an impressive schedule of recitals, concerts, recording and composing. His continued commitment to music education and the value of music in everyday life results in an extensive schedule of guest appearances at universities throughout North America, Europe, Japan and Australia.